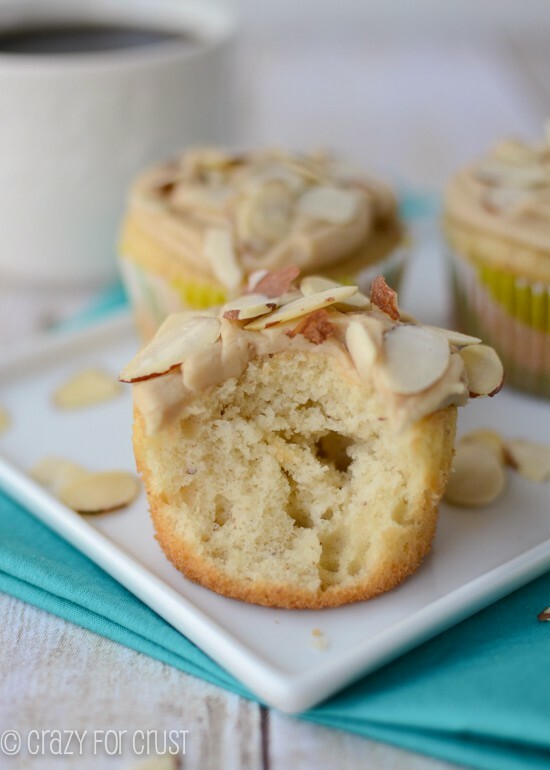 If you love almond, these Almond Cupcakes are for you! 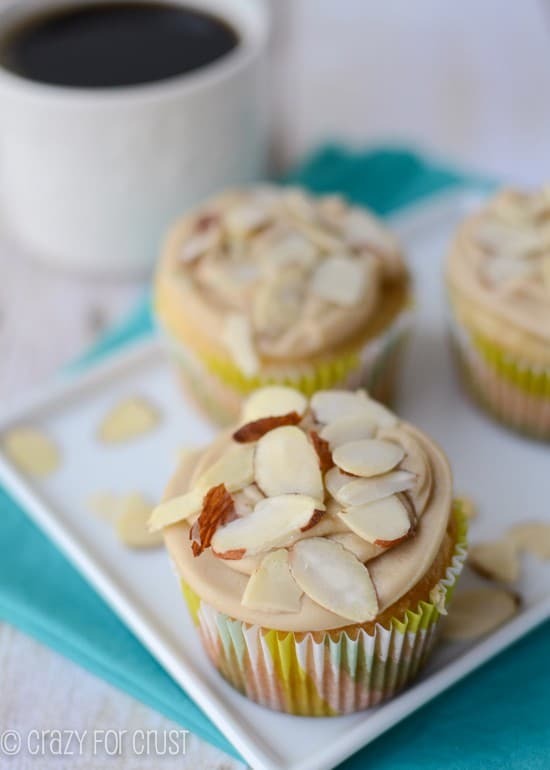 Filled with almonds, the cupcakes are topped with a caramel frosting that tastes like fudge! I called the American Girl Store in LA and asked if I could schedule an appointment for a doll to get her hair done and her ears pierced. Go ahead. You can say it. I’m totally that parent. The one who is obsessed with making her daughter’s doll human. The longer Jordan plays with Jenny, the longer that she cares about things like doll hair, ear piercing, and bunk beds that cost more than a real bunk bed, the longer she stays a kid. In this age of an 8-year-old having her own iPod, worrying about if her shorts are “fingertip length,” and grown-up style music and TV shows, I think fostering a relationship with a doll is an awesome idea. Do I like spending $25 on a doll ‘do? No, but if it keeps my kind younger for even a minute, I’m okay with that. So, next week on our way to Disneyland, I’m going to be that parent who stops for lunch at The Grove in LA. While my husband scouts out Maria Menounos, I’ll spend an hour walking seven miles around and around a doll store trying to find the perfect doll outfit that can be bought with a $30 gift card. What I’m also okay (more than okay) with? 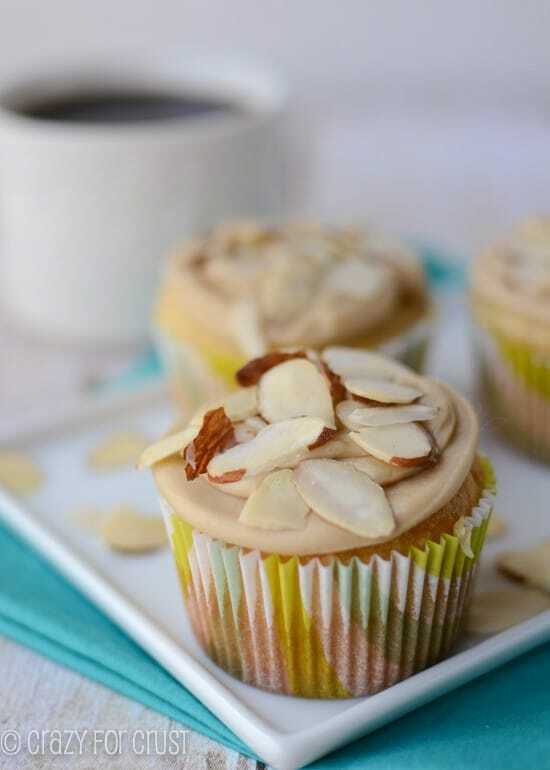 Almond Cupcakes. 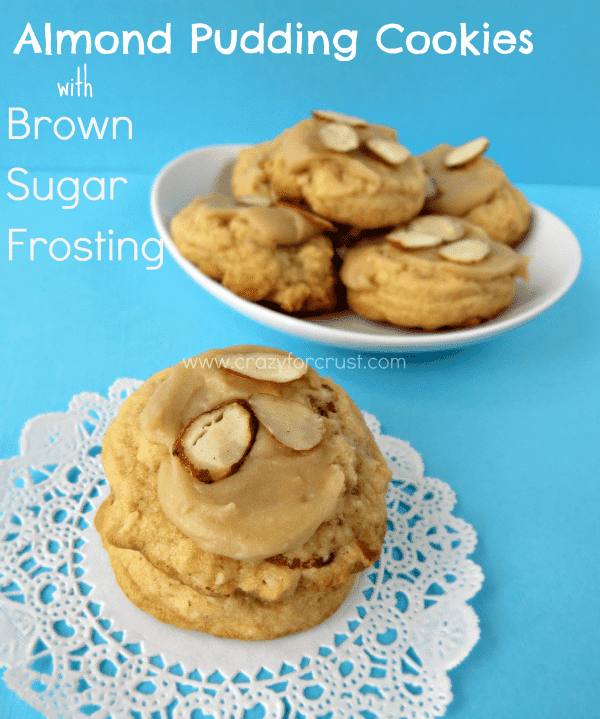 With a to-die-for caramel frosting! 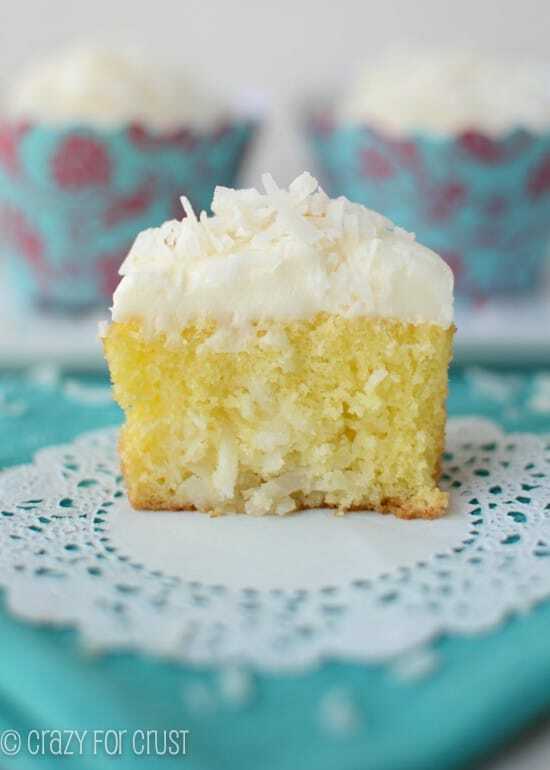 I would rather sit and eat one of these cupcakes than watch Jordan decide between a wheel chair for a doll and a new bathing suit that will never see water. Really, I would rather eat this frosting with a spoon than do most things. It’s from-scratch cooked caramel frosting, people. It doesn’t get much better than that! Unless you put it on top of Triple Threat Almond Cupcakes. Then the frosting. Oh, the frosting. It’s seriously like fudge. It’s hard to spread, but it’s the best stuff ever. Add a little salt for a salted caramel frosting. If the frosting doesn’t make it to the cupcakes, that’s okay. 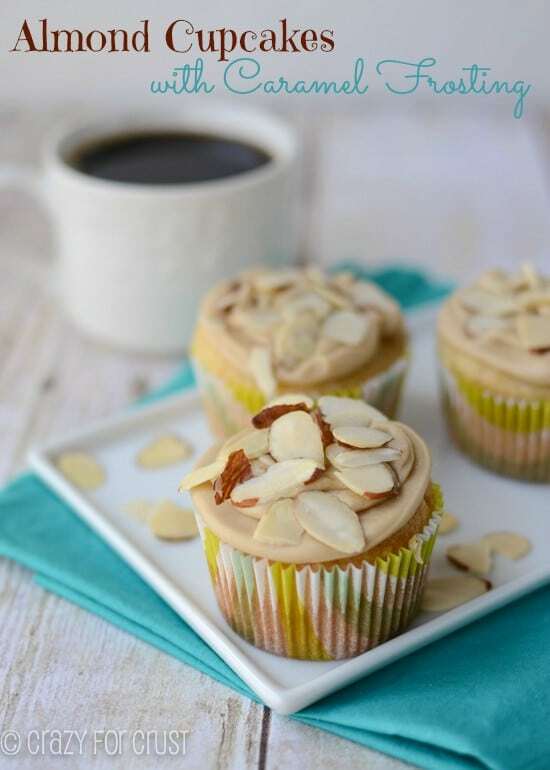 Serve the cupcakes for breakfast and call them muffins. No one will know! Can someone have these waiting for me at The Grove next week? And maybe a martini? I’ll need both. 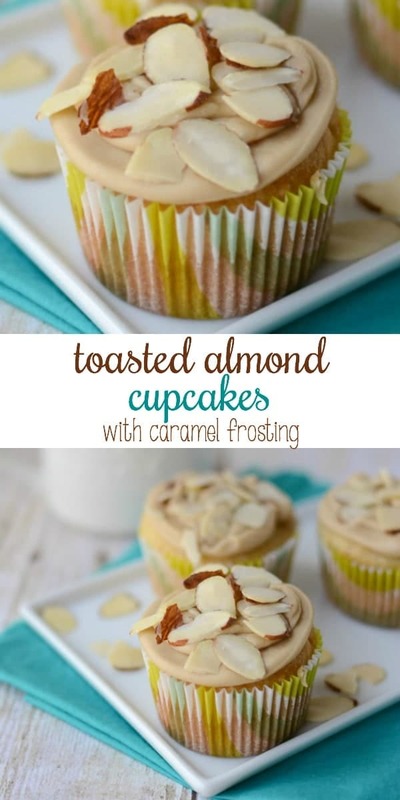 Toasted almond cupcakes that have a rich and sweet caramel frosting! Preheat oven to 350 degrees. Line cupcake pans with liners (24 cupcakes). Place 1/2 cup of the toasted almonds in a food processor and grind until they are finely ground. In a large bowl, beat cake mix, almond milk, oil, eggs, and almond extract with an electric mixer on low for 30 seconds. Turn the mixer up to medium and beat for two minutes. Fold in ground almonds. Divide batter evenly amongst cupcake liners. Bake 17-20 minutes, until a toothpick comes out clean. Cool completely, about 30 minutes. To make the frosting, melt butter in a medium saucepan over medium heat. Stir in brown sugar and heat to boiling, stirring constantly. Reduce heat to low and boil and stir for 2 minutes. Stir in milk. Heat back to boiling then remove from heat. Cool to lukewarm, about 30 minutes. I never had an American Girl doll and I never let my mom forget it 😉 I still secretly hope to get one each Christmas. I had no idea you could get their ears pierced. Now I want one even more. Sometimes it’s fun to still be a kid at heart! Right? I never let my mom forget either! OMG I am SO sorry! It was supposed to be 350! I missed that one big time. 🙁 I just fixed the instructions. Again, I’m SO sorry!